PRISON officer Merick Dickinson was left shocked and sore after an inmate grabbed her hair and tried to rip out her extensions. She'd worn the clip-in extensions to cover hair loss due to tension alopecia as her hair had been damaged from different styles such as tight weaves and braids. Merick, 29, of Edinburgh, had never liked her thin afro hair – and after the incident two years ago she decided she needed to find a more permanent solution so she wouldn't feel selfconscious about it. 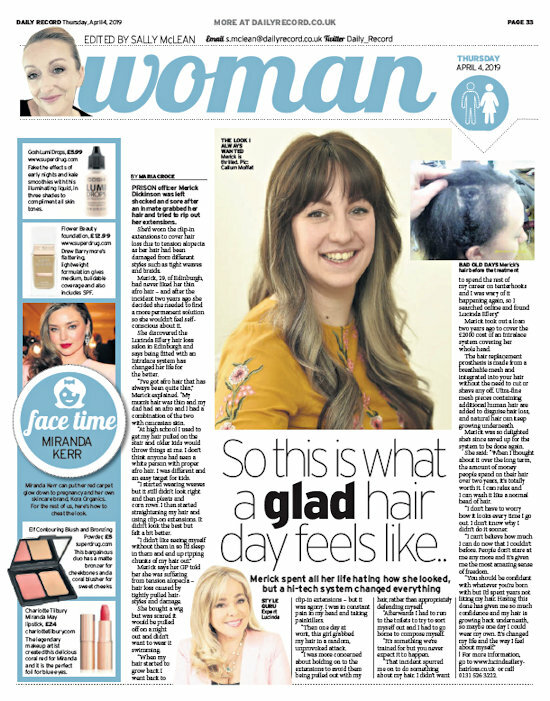 She discovered the Lucinda Ellery hair loss salon in Edinburgh and says being fitted with an Intralace system has changed her life for the better. "I've got afro hair that has always been quite thin," Merick explained. "My mum's hair was thin and my dad had an afro and I had a combination of the two with caucasian skin." "At high school I used to get my hair pulled on the stair and older kids would throw things at me. I don't think anyone had seen a white person with proper afro hair. I was different and an easy target for kids." "I started wearing weaves but it still didn't look right and then pleats and corn rows. I then started straightening my hair and using clip-on extensions. It didn't look the best but felt a bit better." "I didn't like seeing myself without them in so I'd sleep in them and end up ripping chunks of my hair out." Merick says her GP told her she was suffering from tension alopecia – hair loss caused by tightly pulled hairstyles and damage. She bought a wig but was scared it would be pulled off on a night out and didn't want to wear it swimming. "When my hair started to grow back I went back to clip-in extensions – but it was agony. I was in constant pain in my head and taking painkillers." "Then one day at work, this girl grabbed my hair in a random, unprovoked attack." 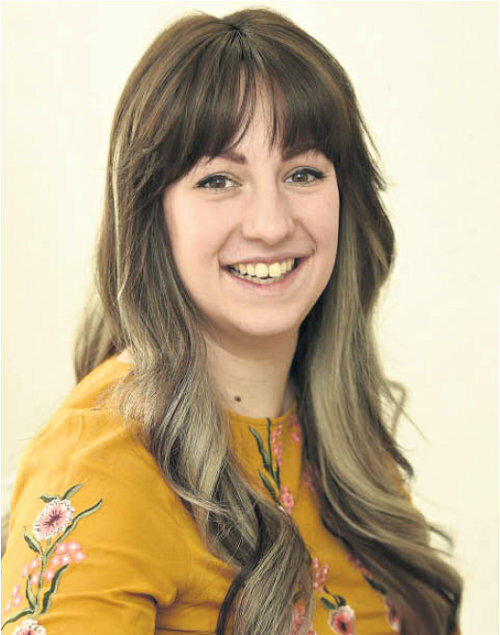 "I was more concerned about holding on to the extensions to avoid them being pulled out with my hair, rather than appropriately defending myself." "Afterwards I had to run to the toilets to try to sort myself out and I had to go home to compose myself." "It's something we're trained for but you never expect it to happen." "That incident spurred me on to do something about my hair. I didn't want to spend the rest of my career on tenterhooks and I was wary of it happening again, so I searched online and found Lucinda Ellery." Merick took out a loan two years ago to cover the £2000 cost of an Intralace system covering her whole head. The hair replacement prosthesis is made from a breathable mesh and integrated into your hair without the need to cut or shave any off. Ultra-fine mesh pieces containing additional human hair are added to disguise hair loss, and natural hair can keep growing underneath. Merick was so delighted she's since saved up for the system to be done again. She said: "When I thought about it over the long term, the amount of money people spend on their hair over two years, it's totally worth it. I can relax and I can wash it like a normal head of hair." "I don't have to worry how it looks every time I go out. I don't know why I didn't do it sooner." "I can't believe how much I can do now that I couldn't before. People don't stare at me any more and it's given me the most amazing sense of freedom." "You should be confident with whatever you're born with but I'd spent years not liking my hair. Having this done has given me so much confidence and my hair is growing back underneath, so maybe one day I could wear my own. It's changed my life and the way I feel about myself."